Home » LibraryReads » EVERY HEART A DOORWAY makes the April 2016 LibraryReads list! EVERY HEART A DOORWAY makes the April 2016 LibraryReads list! FANTASTIC NEWS! 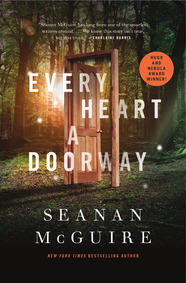 EVERY HEART A DOORWAY by Seanan McGuire is the #7 pick on the April 2016 LibraryReads list! Bestseller McGuire presents a fresh take on the portal fantasy genre that blends Alice in Wonderland, The Magicians, and The Nightmare Before Christmas. EVERY HEART A DOORWAY will be available from Tor.com on April 5, 2016. See the complete April list at LibraryReads.org.